Today, 24 Aug 2010 I passed my exam on my first attempt. The first thing I did to prepare for the exam was to attend a course. 5 meetings, 1 day a week for 5 weeks. 9AM-4PM, with 45 minutes for lunch. The course was great, my lector was amazing in passing the material. After each class, at home during the week I read what we learned again, and they provided us with some sample questions for each section, so I did those. Each week I had more and more material to go over through, as we learned more chapters. After the course I committed to a date as many people here recommended. I took the exam 2 weeks and one day (15 days) after the last meeting of my course, to still have a fresh memory of what was learned there. I never read the PMBOK guide, as in the course they gave us a book of slides which pretty much summarized the PMBOK as well as expanded some of the material. Also, my PMBOK is in my native language, and as the exam is in English I wanted to study the terms and get used to the English version. The language aid to my language wasn’t very successful, as it had a lot of non coherent sentences, like someone used Babylon like crazy!!! I didn't buy Rita or anything else. I just read the slides they gave us (you can read the PMBOK) and did A LOT of practice questions (I think it came close to 2000, but maybe I'm wrong, I lost count a long time ago). I took most of the questions from this site. Oliver is harder than the real exam, but good practice. 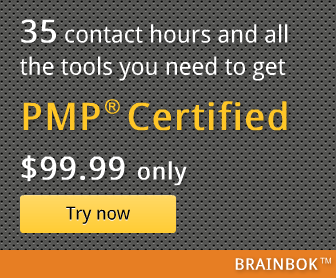 I really liked Simplilearn and pmstudy, those are good exams, close to the real thing. On the exam day itself I came relaxed as much as possible, with a bottle of water and a sandwich to eat later (it's a LONG exam). I took 3 breaks. 2 to have something to drink and use the bathroom, and the 3rd (on question 147) to have a sandwich, drink and refresh. Total time of the breaks was about 20 minutes. I still managed to finish 15 minutes before time, even after reviewing marked questions. Thank you, Kira for sharing your valuable insight, and your contribution. I really appreciate that you took the time to post the lessons learned on the exam day itself. I wish the best for you. These lessons learned were originally posted by Kira here.